Parental Guidance Advised - The original production is long, though you'll never notice it. Several scenes of intense action and several scenes of violence, though not graphic, may make this unsuitable for younger children. Unlike many Miyazaki productions, people get killed in this one, and often. It's a world out of time... or out of step with time. A world full of wonders, where personal air transportation is more commonplace than wheeled cars. A world where a young boy's dreams soar as high as the mythical floating island known as Laputa. Pazu's dreams are about to be realized, when Sheeta, a young princess literally floats down from the skies, right into his arms. The young girl had been captured by the Secret Service, and escaped from her cell onboard flying fortress during a pirate raid, only to fall towards the Earth... and was saved only by a mysterious, glowing pendant -- a pendant made of Leviatation Crystal, the supposed power of Laputa itself. The pendant has attracted the attention of pirates and Secret Service agents alike, and Sheeta and Pazu now find themselves the object of their unwanted attention. But Pazu has a dreamquest to fulfill, one started by his father so many years ago: to prove the existance of the fabled floating island itself. Reportedly Hong Kong's most popular anime film, Tenku no Shiro Laputa has all the key elements of a "typical" Miyazaki film: strong ideals, great action, pure-hearted lead characters, incredible composition, and of course, flying machines. But there's something else in Laputa that sets this movie aside from all his other works, something that makes this special... but more on that later. This 1986 production came two years after Miyazaki's critically acclaimed feature film, Kaze no Tani no Nausicaa, and in a purely technical sense, is far beyond the post-apocalyptic world that he created in his earlier work. Incredibly diverse and complex, the movie's visual composition and ambitious settings will astound you. The degree of imagination and effort dedicated to this production is something I find nearly incomprehensible. From the European influenced meadows and towns, to the Greek inspired architectural elements in the great island castle itself, this world is the product of an imagination without limits. And true-to-form, there are flying machines of every conceivable, (and inconceivable) construction. Miyazaki is obviously a fan of the Fleischer brothers, as well as Jules Verne and Leonardo daVinci -- there's no mistaking their influences in both his animation style and his mechanical designs. You'll be utterly enthralled by the wildly unconventional flying machines -- I could just hear my mind arguing with itself: "There's no way that those things would ever work... ...wow... ...COOL!" That's part of the beauty of Miyazaki's work. Like mythical sirens playing their songs, Miyazaki can suspend your disbelief, and draw you into his realm. Characterisations are unlike his later works (with the exception of Mononoke Hime) -- despite having a fairy tale-like setting and fanciful adventures, there's more of a Hans Christian Andersson undercurrent than the saccharine, simplistic tones of modern-day Disney trappings. This hint of real life shows itself in his characters: some young, innocent and idealistic, some older, wiser, but no more enlightened in their ways, and still others that are driven by more mundane, ego-centric passions. Yes, the characters are somewhat simplified in this movie, but they have elements of the human personality to which we can all relate. Similarily, his story echoes the same sentiments: this is an adventure in the grand tradition of a Jules Verne novel, or perhaps Frank Capra's Paradise Lost. While seemingly wonderously utopian on the surface, there is a darker side to his creation which serves as a most poignant reminder: anything, be it tools, technology or knowledge, can be used for both good and evil. And just as in real life, good and evil are not always immediately recognisable by mere appearances. 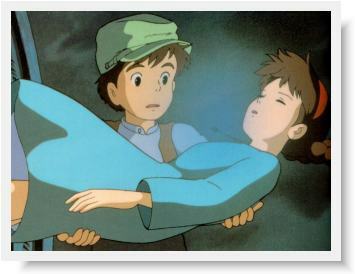 Despite its minor flaws, there is one singular element in Laputa that is more pronounced than any other Miyazaki film. The best storytellers in the world are those that share their true self. I feel that through this particular movie, Miyazaki reveals not his public facade nor his idealistic self, but his true, inner spirit. We see elements of his playfulness, his imagination, his love of nature, perhaps some self-indulgence, as well his darker views about government, the military and the potential misuse of technology. Many people have commented that Laputa is their favourite movie, but from a pure technical standpoint, I feel that there is no basis for this opinion. Technical arguments be damned -- Laputa communicates at the deepest, personal level in an openly honest and vulnerable manner. This is Miyazaki himself embodied as anime.